If you are a diva who loves to turn heads wherever you go and this delightful drape is a must have item for your closet. Get the simplicity and grace with this green and off white color faux georgette and net anarkali salwar kameez. 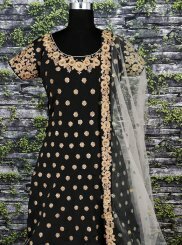 The resham work, lace, patch border work and stones work personifies the entire appearance. Comes with a matching bottom and contrast dupatta.